Mectagrip is Medacta’s plasma sprayed titanium coating designed to enhance initial stability due to its high coefficient of friction and potential long-term fixation inherent to titanium plasma sprayed devices. Plasma spray coating is one of the most clinically proven surfaces to achieve sound fixation in cementless total hip arthroplasty. Since its introduction in the 1980s, it has become one of the gold standards in cementless fixation. Khanuja HS, Vakil JJ, Goddard MS, Mont MA. Cementless Femoral Fixation in Total Hip Arthroplasty. J Bone Joint Surg Am. 2011;93:500-9. Lombardi AV. 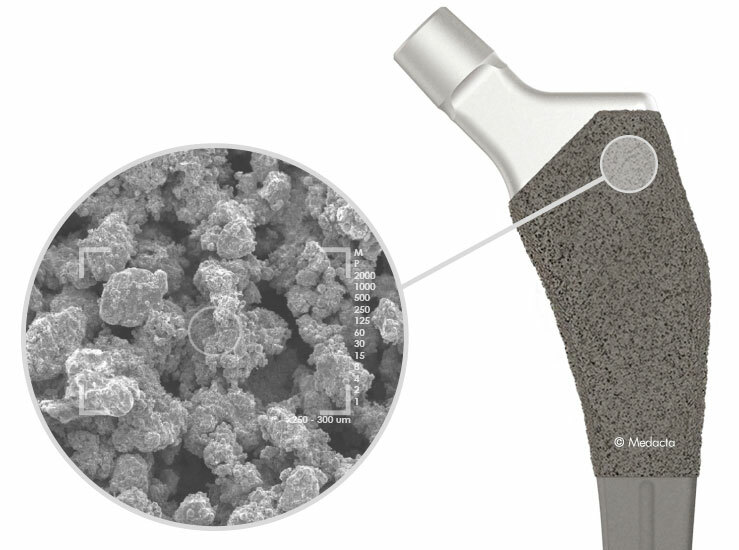 Porous, plasma-sprayed, titanium-tapered cementless stems achieve versatility. Orthopedics Today, June 2006. Friction testing of the Mpact and Versafitcup coating samples. Data on file Medacta. P. Robotti, A. Sabbioni, L. Glass, B. George. Macroporous Titanium Coatings by Thermal Plasma Spray. ITSC 2013, International Thermal Spray Conference, May 13 –15, 2013,Busan, Korea. Biemond JE, Hannink G, Jurrius AM, Verdonschot N, Buma P. In vivo Assessment of Bone Ingrowth Potential of 3-Dimensional E-Beam Produced Implant Surfaces and the Effect of Additional Treatments by Acid-Etching and Hydroxyapatite Coating. J Biomater Appl. 2012 Mar;26(7):861-75.
 de Godoy RF, Blunn G, Coathlup ML, Goodship AE. In vivo Evaluation of Titanium Macro-Porous Structures Manufactured Through an Innovative Powder Metallurgy Approach. Proceedings eCM XIII: Bone Fixation, Repair & Regeneration, June 24–26, 2012, Davos, Switzerland. Goodshi A, Blunn G, Preve E, Facchini L, Bucciotti F, Robotti P. In-vivo Assessment of the Ingrowth Potential of Engineered Surface Topographies Produced by Spark Plasma Sintering. Proceedings 9th World Biomaterial Congress, June 1-5, 2012, Chengdu, China.